Chelsea scraped through with a point, as they drew 2-2 against Swansea, in what was a closely contested duel. 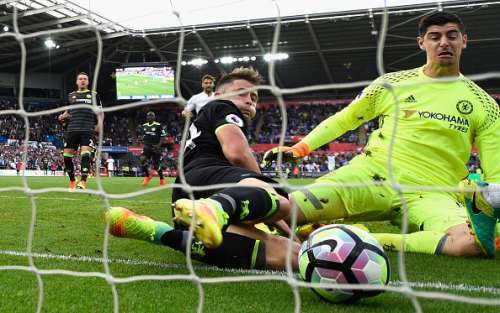 The Blues went ahead after a Diego Costa goal but went behind after goals from Gylfi Sigurdsson and Leroy Fer for the Swans, before Costa scored a second to level the game. The match also caught attention due to some dubious decisions by the referee for the game, Andre Marriner. 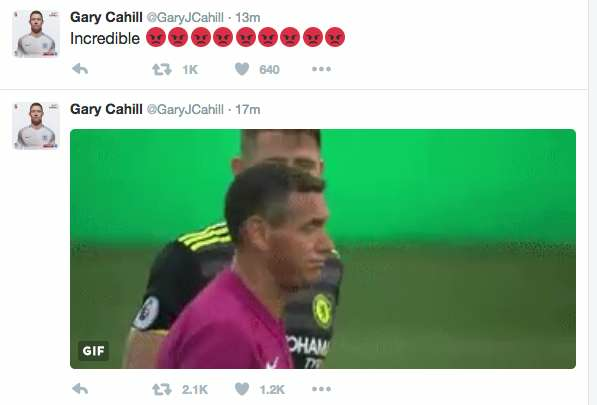 Gary Cahill who was clipped by Fer in the build up to Swansea's second goal was left bemused by Marriner's decision and vented out his anger on social media but later deleted his tweets. The FA might take action against Cahill for bringing the game into disrepute over 'threatening, abusive, indecent or insulting comments about match officials'. “It's all fun and games for the fans, isn't it, but it's the players who suffer. That kills me and my team. We have dropped two points which is massive in this league." He continued, "Look at my face! It's incredible. I said to the referee: 'There's three of you that can see that'. There were two fouls and between the officials they have said that they couldn't see it. For me that is incredible." He posted two tweets with one having the clip of the incident and the next which said 'Incredible' with a lot of angry emoticons. It was also rumoured that Gary Cahill went into the referee's room after the game to talk about the incident. John Terry also posted a photo on social media of him being held by Jordi Amat in the Swans' penalty box in the first half. Terry left the game on crutches and has emerged as a doubt for Friday's big game against Liverpool. On Terry's situation, Conte said, "Tomorrow we'll see the situation about his ankle. He's a warrior. I'm not worried." That's a foul on Gary Cahill - Andre Marriner - how didn't you see that? Leroy Fer with a clean tackle, in the sense that he cleanly kicked both of Gary Cahill's feet without wasting energy contacting the ball.